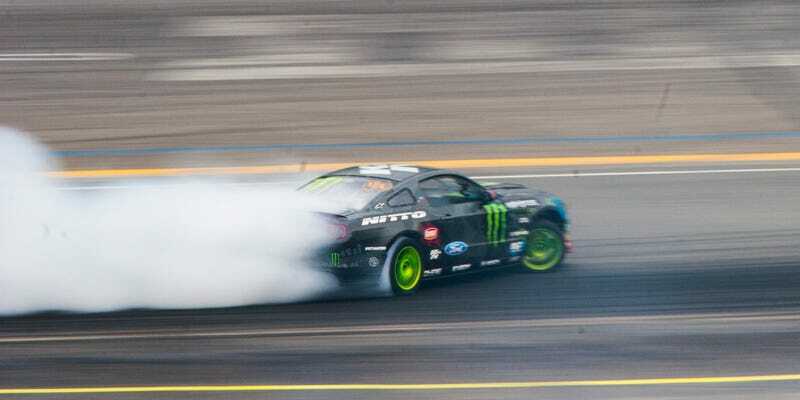 Vaughn Gittin Jr. is one of the standout characters in Formula Drift. He has one of the most professional teams, one of the most pronounced sponsorship deals, and hoards of devoted fans. And some people absolutely hate him. I guess I can see why. The guy has a big of a habit of rubbing people the wrong way. Sometimes this is more literal than figurative, particularly when he drove over another car at Atlanta the other year. Yeah, drove over the other car. Crashed into him, plowed through his fender, and kept on going. But there are other moments when he comes through as one of the most talented drifters around. Here he is throwing his car backwards — backwards — into the turn as his opponent slides off the track. Vaughn picks up the gas at the exact perfect moment, and the front pulls him clear. And the more you see of the guy, the more you realize that Vaughn, maybe more than anyone else in FD, just loves driving. Like an obsessive. Like a savant. There’s some weird duality about the car, too. You look at it and you hear it and you can’t imagine it as anything but a severely rough machine. Vaughn doesn’t drive a Nissan. He doesn’t drive a Toyota or any other import. He’s got a big, lumpy, snort-hood Mustang. The thing looks like a bulldog. There’s a Roush Yates NASCAR V8 under the hood, with a claimed 850 horsepower. The sound is like nothing else at a drift event — it’s like hearing the world get torn in half. But when we go out on track, the impression of impossible smoothness. Even when he launches at the start and tears into the banking, the car feels so composed, so at ease, so assured. Part of that is the Mustang’s setup. Good suspension, good settings. Part of it is Vaughn. He’s one of the more experienced drivers in the field, drifting for well over a decade now. He came up when you didn’t have nearly the kind of horsepower or crazy steering angle you have today. I’ve ridden with some drivers that are absolutely manic behind the wheel. Vaughn is a vision of calm and confidence. He’s virtually never using the handbrake, and he doesn’t clutch kick. He throws the steering wheel in for the turn and follows with measured, massive throttle. So you’re heaving sideways, 55 degrees of angle, induction from the V8 shredding your eardrums from the front, exhaust deafening you at the back, looking out the side window with smoke filling the cabin, and a burly Vaughn sawing the wheel with huge movements to your left. And nothing could feel more relaxed.